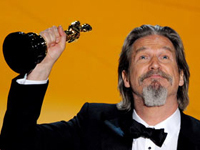 Jeff Bridges, the affable and well-liked star of "Crazy Heart," won the best actor Academy Award Sunday night, an honor that has eluded him four times before. His first nomination came nearly 40 years ago in 1971. "Thank you mom and dad for turning me on to such a groovy profession," a clearly pleased Bridges said in accepting the award. He spoke about how his father, the late actor Lloyd Bridges, used to sit him on a bed and teach him the basics of acting. His mother was the actress Dorothy Bridges. Bridges career has been a mix of critical and popular favorites. One of his most popular roles was as The Dude in the cult classic "The Big Lebowski," but turns in films such as 1984's "Starman" and 1971's "The Last Picture Show" have accounted for some of his previous Oscar nominations. He won for his portrayal of Bad Blake, a past-his-prime country star searching for redemption and another shot at stardom. The role almost never happened — Bridges initially turned down the part because he didn't feel that "Crazy Heart" had the appropriate musical heft. When Grammy-winning producer T Bone Burnett came on board, Bridges signed on to play Blake, whose passion for music is second only to his penchant for self-destructive behavior. The win was not exactly a surprise — Bridges, 60, has been considered the favorite to win the best actor Oscar for months. Voters chose Bridges over George Clooney in "Up in the Air," Morgan Freeman in "Invictus," Colin Firth in "A Single Man" and Jeremy Renner in "The Hurt Locker." Actress Michelle Pfeiffer, who worked with Bridges on 1989's "The Fabulous Baker Boys," praised her former co-star. She recounted how they shared a makeup artist who erased her complexion flaws and seemed to transfer them to Bridges. "It is that kind of attention to detail and lack of vanity that has made Jeff not just a great actor, but a brilliant one," Pfeiffer said.